At Ridgeway Dental, our leading Father and son team, Dr. Jonathan H. Jacobs and Dr. David J. Jacobs, are dedicated to helping patients keep their smiles healthy with quality orthodontic treatment. To better serve the dental alignment needs of patients throughout St. Clair Shores and the Macomb County communities, we offer both traditional and Invisalign® Clear Braces. These orthodontic methods effectively straighten crooked or gapped teeth, preserving patients’ dental health and aesthetics. Whether you choose clear aligners or traditional metal braces, our entire team helps ensure that you achieve the healthy uniform smile you deserve. A properly aligned smile not only increases aesthetics but helps protect dental well-being for many years to come. Orthodontic issues such as gaps or crooked teeth can affect your health, even if these problems seem miniscule. No matter how minor the orthodontic complication may appear, it is recommended to take a proactive approach and seek professional treatment. Drs. Jonathan and David Jacobs offer tailored orthodontic treatment with conventional metal braces and Invisalign clear aligners. Because our practice was built on the notion of our patients’ overall well being our top priority, our St. Clair Shores dentists only recommend the most accurate solutions to best fit the needs of your unique smile. When receiving orthodontic treatment at Ridgeway Dental, no two plans are alike. During your initial examination, both Drs. Jonathan and David Jacobs determine the extent of your orthodontic needs. Our dentists, along with their capable team, help each patient find the right solution for their dental concerns and aid them in achieving healthy, functioning, and aesthetically pleasing smiles. Dr. Jonathan H. Jacobs offers traditional metal braces as a reliable alignment solution for correcting a wide variety of dental problems and has done so for many years. During treatment, our team tracks your progress and performs any necessary adjustments. Younger patients can especially benefit from this form of orthodontic care. For patients who would like to avoid conventional braces all together, Dr. David H. Jacobs provides alternative solutions with Invisalign clear aligners. This form of orthodontic treatment involves a series of virtually invisible aligners that can be removed during eating and at-home oral hygiene routines. For the best possible results, the trays should be worn 22 hours a day and are ideal for responsible teens and adults. Our dentist closely monitors your alignment progress during appointments, making sure you are compliant with wearing your trays. 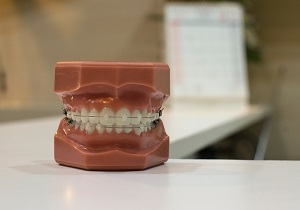 Patients graduate through treatment as we will provide you a new set of trays about every two weeks until the desired dental alignment is achieved. If alignment issues are hindering your ability to speak or chew, you should consider orthodontic treatment. At Ridgeway Dental, Dr. Jonathan H. Jacobs and Dr. David J. Jacobs help patients achieve the healthy smiles they deserve by offering personalized orthodontic counsel and outlining effective treatment plans. To schedule your consultation for our orthodontic services, call our office today!